When you own a dog, every household decision you make affects his happiness and well-being -- and that includes bringing in a new pet. Whether you're planning on adopting a cat or a less conventional animal such as a potbellied pig, it's absolutely crucial to consider beforehand how your precious pooch might feel about the new four-legged stranger -- and vice versa! Although the mere notion of keeping a pig as a pet might seem foreign to many, a lot of people do successfully and happily keep potbellied pigs in their homes. These pigs are often described as being intelligent, vibrant, affectionate and even tidy animals who love being around the people in their lives. Some potbellied pigs, just like cats, even learn to eliminate in litter pans. Shedding isn't usually an issue for potbellied pigs, at least not excessively so, and their sturdy skin generally isn't susceptible to pesky parasites such as fleas. Without plentiful attention and stimulation, however, they are sometimes susceptible to feelings of tedium, and to cope might turn to problematic behaviors such as clumsily exploring the interior of your home. It definitely isn't out of the question for a dog to get along well with a potbellied pig -- and some do. Despite that, it's important to never, ever (regardless of how long they've been living under the same roof) permit dogs and potbellied pigs to be together without supervision. Remember, as sweet as your canine is, he's a predator at heart, and he might just view a potbellied pig as prey. 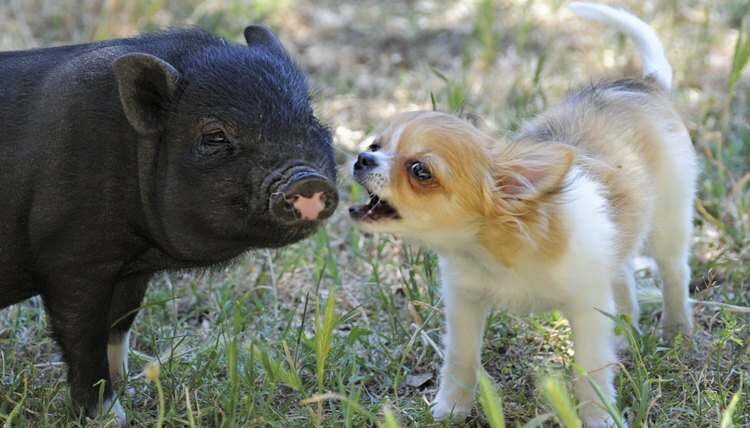 Also, potbellied pigs are often innately apprehensive around canines. Allowing dogs and potbellied pigs to ever be alone together is a major risk that you shouldn't take. The last thing you want is for a hazardous physical fight to ensue. Also remember that strong training and socialization skills are necessary for both animals involved. If you're contemplating allowing a potbellied pig and dog to live under the same roof, it's of utmost importance to take your dog's overall temperament into consideration. If your pooch gets fierce around other animals and goes as far as to run after them, then he's just not a good match with a pig. If you have any concerns or questions regarding how your dog might behave around a pig, talk to a professional pet behavior expert. Safety is always the big priority, not only for your dog, but for any pig you bring home, too. Potbellied pigs, in the majority of cases, get along swimmingly with felines, especially if they were reared around each other. Even if these creatures don't become the greatest of friends, they usually develop peaceful relationships in which they pay no attention to each other. Note, however, that some cats react timidly around brand new and unfamiliar potbellied pigs. It's not easy to predict how a cat might feel upon encountering a pig for the very first time.